A few miles and up the hillside – a very steep hillside/mountain – from Clarkdale and Cottonwood, Arizona is the historic town of Jerome, Arizona. The fact that residents pride themselves on their probable insanity is based on the location of the former mental asylum and the fact that the town is perched precariously on hillsides. 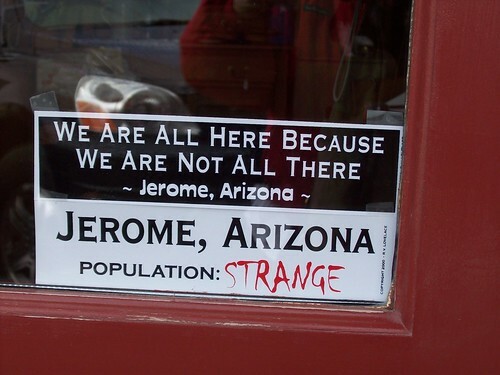 Ironically, you drive through “Deception Gulch” to reach Jerome.